If you are trying to avoid a complete roof replacement due to the inconvenience or the expense involved, we have a much more affordable solution: roof coatings. Our coatings can be applied on virtually any type of roofing material, including single-ply, metal, modified bitumen, built-up, or polyurethane foam. The coatings that we offer are much less expensive than a re-roofing, and much easier and quicker to apply. Imagine having your roof fixed with virtually no disruption to your normal routine! We can apply this to any flat or low-slope roof, and metal roofs as well. Heat Reflection – When the sun's energy is directed away from the roof, your building is a cooler and more comfortable environment. Fire Resistance – Our roof coatings will greatly slow the progress of a fire, and in some cases may qualify you for a reduced property insurance rate (check with your insurance agent for details). Energy Efficiency – A cooler roof means your AC system doesn't have to work as hard to maintain a reasonable temperature inside the building. Improved Appearance – For an older roof, this is a great bonus. Give your roof the appearance of a facelift, without having to replace it. 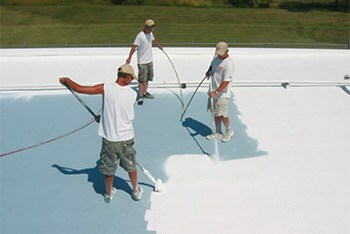 One of the roof coatings that we offer is a rubber roof coating. The membrane is left with a seamless layer of protection that is extremely durable. Our customers really love this type of coating (particularly those with flat roofs) because they are great at conserving energy and very effective at sealing the roof. Why go to the trouble and expense of replacing the existing membrane, which will again wear out soon because of being uncoated? Our service gives the roof a complete waterproof exterior without all that hassle, and much less expensively. A traditional commercial roof is dark in color, which means it stores heat during the day and radiates the heat away after the sun goes down. This usually means a greater likelihood of cracks and eventually water will get through. It also puts a greater strain on your air conditioning system. When our white (or lighter colored) roof coatings are applied, they have the beneficial effect of reflecting the heat of the sun away from the building. This means a cooler roof, a cooler building, and lower utility bills. Another benefit: the federal government is now offering some great tax breaks for improvements that bring about energy savings, and that includes coatings that make your roof cooler. There are also some savings available in certain areas from state governments. The roof coatings that we apply qualify under the energy efficiency guidelines of Energy Star.